WOW! Thank you all for your interest in Mini Chefs! Enrollment for Series 1 filled up quickly! You may now reserve your spot for Session 2! We look forward to cooking with you and your little ones! 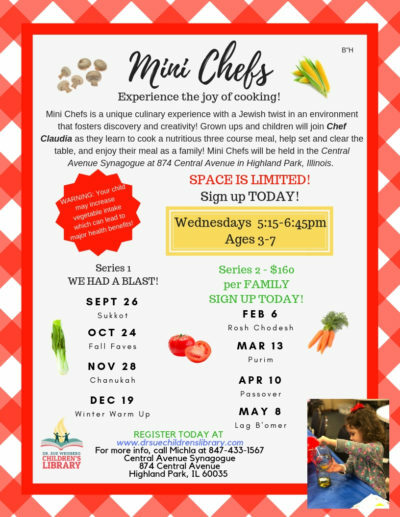 Mini chefs is a hands on, culinary experience with a Jewish twist! Grown ups and children will join our Chef as they learn to whip up a nutritious meal, help set and clear the table, and enjoy their meal as a family. Cost for the Series is $160 per Family. How did you hear about The Dr. Sue Weisberg Children’s Library?